If you are looking for a sleek and compact all-in-one inkjet printer, then Canon Pixma MG7751 may be a good choice. It is designed to meet the requirements of home users and photographers. It has wireless connectivity, support for mobile printing and much more to explore. The all-in-one comes with a weight of 6.9 kg and measurements of 43.5 x 37 x 14.8 cm (width x depth x height). A decent LCD colour touchscreen of size 8.8 cm adds to the ease of printing, scanning, and copying quickly. The printer gives out photos with a resolution of up to 9,600 dpi that is good enough to impress photographers. Both printing speed for mono and colour correspond to 15 ppm and 10 ppm respectively. 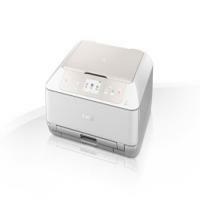 Furthermore, the printer features WiFi Direct that allows you to print via smart devices and Google Cloud. All the more, it also enables printing photos that are stored in a digital camera or memory cards. The machine goes well with some of the latest versions of Windows and Mac operating systems. Canon Pixma MG7751 offers reliable printing, scanning and copying option to home users. This provides the flexibility to print from any smart device and photo printing via memory cards and cameras. In addition, the Canon Pixma MG7751 ink cartridges available in 5 colours is one of the highlights. All in all, the inkjet is an ideal choice for home users and budding photographers. How to fix leaking Canon Pixma MG7751 ink cartridges for Canon printer? The printer ink cartridges contain a special mixture of lubricants and ink to create images or letters or any special character (while running through an electric printer). Most cartridges are watertight with only a small hole for distributing the ink mixture. But hardly faults may exist within the cartridge itself. When such faults occur, it is important to fix or replace the cartridge as soon as possible in order to prevent damage to the machine itself. Step 1: Remove the printer cartridge from your printer and wipe both the housing and the cartridge with an alcohol-based wipe. Do not try to use a water-based solution for wiping as it may damage electrical components. Step 2: Clean the printhead where it is in contact with the cartridge. At times, dirt or debris at the connection point can cause leakage that is not due to a faulty cartridge. Step 3: Rub a soft cloth or a tissue over the cartridge until you have identified the leaking zone. If it is only coloured at the outlet, it means that the cartridge is fine. Step 4: Once you have determined the location of the leak, inspect the cartridge. You should see a crack or fault. If not, inspect the cartridge until you find the damaged area. Step 5: Wipe the cartridge once more after you have identified the location. After this, cut a piece of tape large enough to cover the affected area. Step 6: Place the tape over the affected area, which should be smooth as much as possible. You can then replace the Canon Pixma MG7751 ink cartridge in the machine and test to ensure that the area is firmly protected against future leakage. Sometimes you can also fix a leaking issue by removing the Canon Pixma MG7751 ink cartridge and putting it back in again. Q. What type of paper is supported by this printer? A. Canon Pixma MG7751 printers can handle various types and sizes of paper. You can use A4 size, A5 size, B5 size, Letter, Legal, Envelopes (DL size or Commercial 10), 20x25cm, 10x15cm, 13x18cm, glossy paper, semi-glossy paper, matte paper, high-resolution paper, photo stickers and printable discs with this printer. Q. How do I check the remaining ink levels of my Canon Pixma MG7751 ink cartridges? Turn on the power and press the “Home” button on the printer. Touch the “Setup” icon to open the setup menu screen. Tap on the “Ink levels” icon to display a graphic showing the remaining ink levels in each cartridge on the screen. When the ink levels are running low, a warning symbol will be displayed over the respective colour, indicating that you keep a replacement ready. Q. I have been using original ink cartridges for my Canon Pixma MG7751 printer. However, I wish to switch to a cheaper alternative as original ink cartridges are quite expensive but, I do not want to compromise on performance. What should I do? A. You should opt for our compatible Canon Pixma MG7751 ink cartridges. They are the perfect choice for you! All our compatible ink cartridges are FSC tested and certified and use good quality ink. They are also very cheaper than original ink cartridges, thereby reducing your overall operating costs. Q. How much power do Canon Pixma MG7751 printers consume? A. Canon Pixma MG7751 printers use about 15 watts of power while operating and around 1 watt while on standby mode. Q. Is there any difference in buying Canon Pixma MG7751 ink cartridges individually and in multipacks? A. There is no difference in the ink cartridges provided. However, buying the ink cartridges in a multipack is cheaper than buying all ink cartridges individually. This encourages long-term savings for the user. Q. What are the features of Canon Pixma MG7751 printers? A. Canon Pixma MG7751 printers are equipped with a scanner and a copier, making them a 3-in-1 machine. They are capable of high-quality printouts and can print on discs as well. They also come with an automatic duplexer to help save time and efforts and have multiple interfaces for pages. You can also connect your mobile devices to this printer via Wi-Fi. The MG7751 is a great choice for students and small office owners.